Built to deliver professional performance, the Precision 3000 Series Mini Tower Workstation from Dell is a fully configurable and ISV-certified system. This system is powered by a 3.4 GHz Intel Core i7-6700 Quad-Core processor which will allow you to run multiple applications simultaneously. The 8GB of 2400 MHz DDR4 RAM helps to ensure smooth multitasking and also allows the computer to quickly access frequently used files and programs. While the current memory configuration is 2 x 4GB, there are four 288-pin DIMM memory slots that will allow the RAM to be upgraded to 64GB, using one 16GB module in each of the four memory slots. For storage of your files, a 1TB 7200 rpm SATA III 3.5" hard drive offers quick access to your data. If you want to add external storage drives or other peripherals, the Precision 3000 Series features six USB 3.1 Gen 1 Type-A ports (2 front, 4 rear), four USB 2.0 Type-A ports (2 front, 2 rear), two PS/2 ports, and a serial port. For users who wish to add additional components or upgrade the drive bays, there are two internal 3.5" drive bays that can each fit one 3.5" drive or two 2.5" drives, plus one M.2 2280 slot and two external 5.25" drive bays. The integrated Intel HD Graphics 530 chipset delivers a sharp, clear picture while allowing for multiple simultaneous displays to be used via its two DisplayPort and single HDMI video outputs. Whether you are listening to music, watching a movie, or playing a game, the integrated Realtek HD ALC3861 audio codec outputs high definition audio and delivers higher fidelity than standard audio controllers. 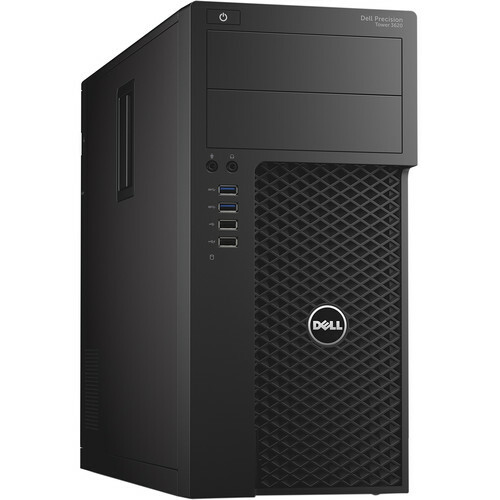 Dell's Precision 3000 Series Mini Tower Workstation includes their KB216 USB keyboard, their MS116 USB mouse, and a power cord. It operates using a 290W 85% efficient power supply. While the installed operating system is Windows 7 Professional (64-Bit), a Windows 10 Professional (64-Bit) license is also included. Power through intensive tasks with a 3.4 GHz Intel Core i7-6700 Quad-Core processor for fast and stable performance. A mini tower form factor provides a compact size with the option to expand as your business needs grow makes, making this system well-suited for saving footprint space without sacrificing power or potential. You can choose your level of security with a number of beneficial options, including: Dell Data Protection, Security Tools + Dell ControlVault, Encryption Personal Edition, or Enterprise Edition. Store and access large and complex 3D, multimedia, and video project files with the speed and reliability of up to 64GB of 2400 MHz DDR4 memory. Separately-sold FIPS-certified self-encrypting drives (SEDs) can help reduce security risks and unauthorized access to your data. Different applications have different system requirements. Let the Dell Precision Optimizer take the guesswork out of customizing settings by automatically adjusting system settings. Free with your Precision workstation, the Dell Precision Optimizer, with SCCM centralized management, automatically tunes your Workstation to run some popular Independent Software Vendor (ISV) applications at fast speeds, enhancing productivity. The Dell Precision Optimizer generates real-time performance reports for processor, storage, memory, and graphics utilization, as well as send a system report to IT for analysis. This system is pre-installed with Windows 7 Professional software and also comes with a license and media for Windows 10 Pro software. You may use only one version of the Windows software at a time. Switching between versions will require you to uninstall one version and install the other version. You must back up all data (files, photos, etc.) before uninstalling and installing operating systems to avoid loss of your data. Box Dimensions (LxWxH) 21.9 x 18.5 x 13.7"